This is a continuation of my William Stringfellow Project where I read through all of William Stringfellow's books in chronological order in their first editions. This is the fifth installment of this series. We've already done the first four of Stringfellow's books: A Private and Public Faith (1962), Instead of Death (1962), My People is the Enemy (1964), and Free in Obedience (1964). 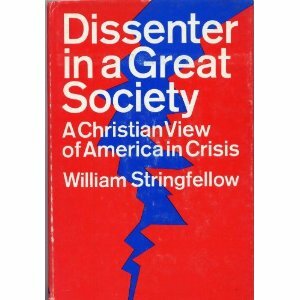 The fifth book published by Stringfellow, in 1966 by Holt, Rinehart, and Winston, was Dissenter in a Great Society: A Christian View of American Crisis. The first edition dust jacket is pictured here. This book has no other ambition than to be a chronicle of criticism, complaint, and dissent, informed, I trust, by the faith and ministry exemplified in Christ, in which all things whatsoever are brought into question in this life. This "chronicle of criticism, complaint, and dissent" has four chapters. Chapter 1 deals with poverty. Chapter 2 deals with the American political crisis characterized by a "breakdown in rational public dialogue" between the political ideologies captured, as they are, by the Republican and Democratic parties. Chapter 3 deals with race relations. The final chapter is meant to articulate a vision of Christian political involvement, what Stringfellow calls "the orthodoxy of radical involvement." America has the technical capacity to abolish poverty; the question is: does it have the moral capability to do so? Here in 2012 we are still asking that question. According to Stringfellow, much of our inertia on this question has to do with how we've moralized socioeconomic status, where the poor are considered to be immoral and lazy and the rich are considered to be hardworking and virtuous. Much of this stereotyping is due to the fact that both rich and poor have been ghettoized and, thus, rarely come into contact with each other. The concealment of poverty by ghettoization of the poor means that both prosperous and poor live so separately and have so little human contact of any kind, are so accustomed to acting out a charade instead, that each regards the other in stereotypes which seldom contain much truth. The most popular stereotype of the poor is that in America a person is poor by choice and not because of circumstances beyond his or her own influence. Thus, if the poor were not so lazy, they would not be poor. If the poor were not so promiscuous, they would be able to support themselves. If the poor were not so profligate in drugs and drink and other dissipations, they would escape from their misery. These are common variations of the same theme that accounts for poverty as proof of moral decadence. Driven to its ultimate logic, to be poor is a grave sin. Such a stereotype of the poor is credible and popular among the prosperous because it implies that to be prosperous is a sign of moral superiority. Neither side of the stereotype is true, however, either empirically or theologically. Poverty, like wealth--in America as elsewhere--is more often a matter of inheritance and coincidence than of choice or initiative. The other aspect here that Stringfellow is keen to stress is how there are structural associations between the rich and the poor. Conscience, for Stringfellow, is for the rich to recognize how their lot in life affects the lot of the poor. Conscience, in other words, is knowing that men are related to, and responsible for, each other in all things. That is why poverty cannot be accounted for by blaming it on the poor, since the prosperous are proximately involved in the institutionalization of poverty in society. The causal relation here is, of course, not direct. Our complicity is institutionally distributed and generationally inherited. This, for Stringfellow, is tantamount to the doctrine of the Fall and Original Sin. To affirm that men live in this world at each other's expense is a confession of the truth of the Fall rather than an assertion of economic doctrine or a precise empirical statement. It is not that there is in every transaction a direct one-for-one cause and effect relationship, either individually or institutionally, between the lot of the poor and circumstances of those who are not poor. It is not that the wealthy are wicked or that the fact of malice is implicit in affluence. It is, rather, theologically speaking, that all human and institutional relationships are profoundly distorted and so entangled that no man or principality in this world is innocent of involvement in the existence of all people and all institutions. I believe Stringfellow is simply saying that capitalism isn't the Messiah. Capitalism is contaminated by sin like all other human institutions. And, thus, Christians are passionate about addressing and redressing those sins. Chapter 2 wades into the apocalyptic mess of politics in the 1960s. One part of Chapter 2 that caught my attention was Stringfellow's analysis regarding the thirst for theocracy among many Christians, the quest for a Christian and God-fearing nation. A lot has changed since the 1960s. But it also seems that not much at all has changed. The electoral map shows that we continue to live in Nixonland with the sequela of his Southern Strategy. Chapter 3 turns to race relations. A lot of this material Stringfellow covered in his earlier My People is the Enemy. What I'd like to point out is the radical--and I do mean radical--ending of this chapter. Again, the year was 1966. The historic Civil Rights Act of 1964 and Voting Rights Act of 1965 had recently been signed into law. And yet, race relations were deteriorating badly. The patient non-violence of Martin Luther King, Jr. was being increasingly criticized within the black community as Uncle Tom behavior. The more aggressive and militant Black Power movement was on the rise. Race riots were breaking out. The most significant of these was the Watts Riots in 1965. The Cross means the invincible power of God's love for the world, even though all the world betrays, denies, abhors, fears, or opposes the gift of His love for the world. The Cross means voluntary love which is undaunted by any hostility or hatred or violence or assault. The Cross means voluntary love which is not threatened by death. The Cross means voluntary love which perseveres no matter what. The Cross means the gift of love even to one's own enemy--even to the one who would take one's life. Whenever it comes to pass that white men who are Christians are attacked by Negros and endure ridicule or humiliation or interference or taunting torture; whenever it comes to pass that white Christians are exposed to the loss of their possessions, or status, or jobs, or property, or homes, or even families; if one's own life itself is at issue, let the witness of white Christians--for himself, for all men, and, in fact, for all people everywhere--be the witness of the Cross. Even if the knife is at the belly, let the white Christian not protest. Let him receive the assault recklessly, without precaution, without resistance, without rationalization, without extenuation, without a murmur. Is this asking for too much from white American Christians? Have they too long forgotten and forsaken the Cross? God has neither forgotten nor forsaken the Cross. This is why there is no other way that this enormous, desperate, growing accumulation of guilt, shame, estrangement, and terror can be absolved. There has never been--for anyone, anywhere, at any time--any other way. In the work of God in our midst, reconciling black men and white men, there is no escape from the Cross. This is a crazy, breathtaking passage. This might be one of the most radical things written by a Christian in the midst of the 1960s American racial crisis. It is surely one of the most radical things I've ever read. In the face of rising black violence and rage, Stringfellow calls on white Christians to non-violently absorb the rage, to follow the way of the Cross without complaint, objection or protest. For Stringfellow, only the Cross is sufficient to overcome the evil legacy of chattel slavery in American history, the antidote to the generational poison that oozed through the veins American life. The Cross. There is no other way. Stringfellow ends Dissenter in a Great Society with a vision of Christian political engagement. For Stringfellow this means incarnating a life of radical reconciliation. To be a Christian, to be already reconciled, means to love the world, all the world, just as it is--unconditionally. [R]econciliation in Christ means loving the world absolutely. The time is immediate, not later on; the place is here, not any other or after place...It means, finally, loving your neighbor in the realization that each person's real neighbor is the one who is our enemy. The commandment to love one's neighbor, and the example, in Christ, of love for one's enemy are ultimately synonymous. The idea here is that the primary conflict facing the Christian isn't the battle between good and evil. Humans don't have the moral or intellectual capacity to make that discernment, the ability to sort the world into The Good Guys and The Bad Guys. The basic confession of the Gospel of Christ acknowledges that men and women do not possess, either personally or socially, the knowledge of good and evil, and that ultimate moral knowledge is the unique prerogative of God, who judges all men and all things as He pleases. The battle, then, isn't between good and evil but between death and resurrection. The drama of history, exposed in the insight of the Gospel, is not a conflict between evil and good, as secular ethics supposes, but concerns the power of death in this world and how death is overpowered in this life by the power of the Resurrection. Reconciliation, then, is overcoming the estrangements we experience--interpersonally, economically, politically, institutionally--because of the presence and power of death in the world. Reconciliation thus becomes a sacrament of life and a sign of the Resurrection in the midst of the Fall. For Stringfellow the church is to display and live out this reconciliation. [T]he Church lives now as the new society in the midst of the old, as the reconciled community when all else is broken and distorted, as the new creation during the era of the Fall, as the example and vindication of life transcending the power of death. Hence the vocation of the Church of Christ in the world, in political conflict and social strife, is inherently eschatological. The Church is the embassy of the eschaton in the world. As always Richard, thank you for continuing to expose us to Stringfellow. Particularly, "The Church is the embassy of the eschaton in the world." Love it, love it, love it. You rightly pass for an anarchist, Richard. "The most popular stereotype of the poor is that in America a person is poor by choice and not because of circumstances beyond his or her own influence. Thus, if the poor were not so lazy, they would not be poor. If the poor were not so promiscuous, they would be able to support themselves. If the poor were not so profligate in drugs and drink and other dissipations, they would escape from their misery. These are common variations of the same theme that accounts for poverty as proof of moral decadence. DRIVEN TO ITS ULTIMATE LOGIC, TO BE POOR IS A GRAVE SIN" (emphasis qb's). Wow, that may be the best example of a resounding _non sequitur_ that qb has ever read. It would seem that Stringfellow, brilliant as he was, was not immune to the temptations of careless logic when he saw an opportunity to score ideological pionts and to flog his politics. Moreover: Given his predilection to logical carelessness, then, Stringfellow himself is guilty of the rhetorical form of the senseless violence that he so deplores in the name of Christ, to wit, creating an absurdly distorted caricature of his opponents' views and then destroying that with his rapier polemics. In doing so, he has not actually defeated his opponents; he has defeated a ridiculous image of them that exists, if at all, only in his imagination. Though I understand your objections, I do think Stringfellow is making an interesting point. Being poor has been moralized in America. Sometimes rightly so, but many times at the expense of failing to consider systemic evils. Regardless, being poor is very shameful in America as we feel like failures, often moral failures, before our peers, our families and in our own eyes. Ask the unemployed about the shame they feel. qb, would you mind explaining how you see this as a non sequitur? Thanks. I also appreciate the exposure to Stringfellow... When I read through this post, "The Cross. There is no ther way" jumped out at me. For any type of reconciliation to happen in any situation where it is needed, someone is going to have to absorb, embrace, and deal with some level of suffering - no matter how little or how much. So much of confessional Christianity, with it's emphases on believing the "right things," misses the real-world application of the right things. 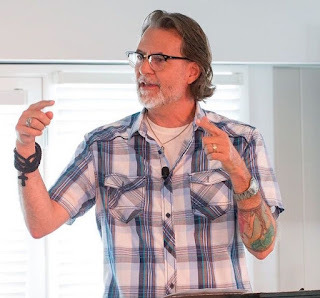 I see somewhat more clearly where the disconnect is between the existence and flourishment of institutional Christianity and the glaring reality that our culture is not being more positively impacted by Christ-followers. We were discussing the recent Connecticut tragedy during Sunday School last week, and the resounding questions was what can "we" do... We as Christians, We as society, etc... And one thought stood out to me, indeed it's the same thought that came back to me when reading this post. 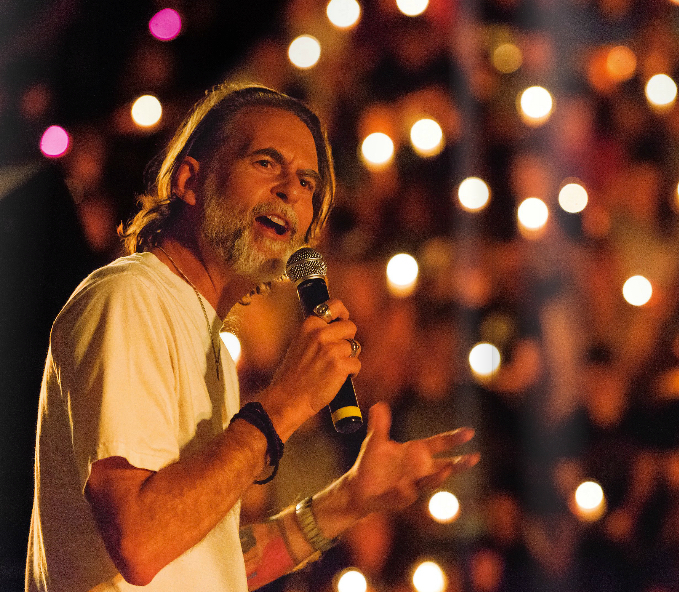 What can "we" do to be a truly resurrected people in the midst of this dark world? And it's so simple, yet perhaps the hardest thing for us to do. We create spaces or priority in our lives for God, to simply listen, pray, meditate and get in position for his Spirit to change us. I know that sounds over simple, but it must be essential - because it's the hardest thing to accomplish. Wow, Mike, it isn't patently obvious? That's pretty scary. P1: Laziness, promiscuity, and dissipations are causes of poverty. P2: Laziness, promiscuity, and dissipations are sinful choices. C: Poverty is itself a sin. Mike, that this is not an obvious non sequitur to you is breathtaking. Can you say, "category mistake?" I actually don't think Stringfellow is making a logical argument. He's making a sociological observation that, if you unpack it, leads to a conclusion. In fact, I think that Stringfellow would agree with you that the underlying logic governing our views is flawed. Such grace and kindness in your reply. On a different note, the paragraph with "the Cross means..." is one of the greatest things I've read in awhile. Thanks for posting it. I discovered in college, long ago, that I was pretty good at picking apart inferences, and began to take pride in my ability to shoot down others' views. (I'm still not over myself...) So when in my Shakespeare class we read Brutus' famous rationale for killing Caesar, I took delight in pointing out how flawed Shakespeare's reasoning is. ("So Caesar may; Then lest he may, prevent.") The prof looked at me the way you or I would view a cockroach scuttling across our kitchen floor. Wm. James wrote about politics that 99% of the time "not insight, but prestige of the opinions, is what makes the spark shoot from them and light up the sleeping magazines of faith..."
and he speculates, from what he sees people saying and doing, as to what sort of notions are motivating the incident. It is hardly "violence" to make those hypothesised rationales illogical, when the behavior to be explained defies plausible justification. You might check out Chris Hayes's book Twilight of the Elites, which discusses social distance and its consequencs at length. define our relationship to the world. I don't understand why my comments look like crappy poetry. That sounds interesting and pretty well in line with what Hayes argues, which is that social distance has increased in American society over the last several decades, leading to a widespread cynicism about large institutions (government, corporations, and the Catholic church, for example). Interestingly, he traces it to the idea of meritocracy; despite the rhetoric, meritocracy is designed to create inequality of outcome, and when people succeed, they tend to help out they know and pull the ladder up behind themselves, creating oligarchy. Trailing behind here in this awesome project. Just started this yesterday and I can't believe it, but it's amazing, so prescient, so inspiring -- about half way through the 2nd chapter (the one on politics). I would put this one as even better than *Instead of Death* and *Free in Obedience*, which were incredible too.